Dan Brown, co-director of Educators Rising, leads a workshop at UD with Delaware high school teachers, urging them to encourage their students to explore teaching careers. After attending the Success Through Education workshop, A.I. duPont High School social studies teacher Tom Hogan says he hopes to use the resources of Educators Rising to encourage his own students to pursue teaching careers. UD student volunteers, all of them majoring in education, prepare to meet informally with 75 visiting high school students. 2 p.m., Nov. 10, 2015--With a looming national teacher shortage and a steady decline in the number of college freshmen interested in studying education, the profession needs to move its focus to encouraging high school students to start thinking about a career in teaching. 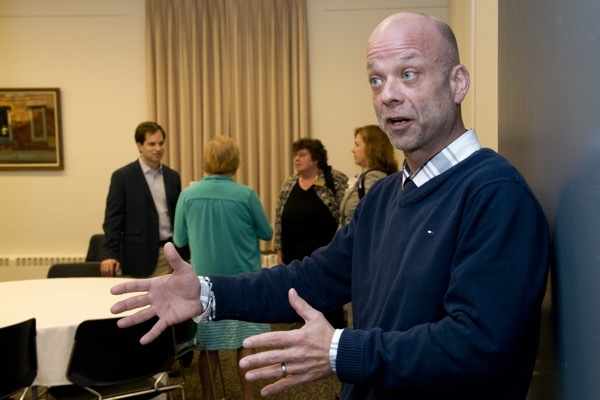 Dan Brown, co-director of the nonprofit organization Educators Rising, delivered that message to a group of high school teachers and about 75 of their students at the University of Delaware on Nov. 5. Brown was the keynote speaker at the daylong Success Through Education event, a program UD has been offering for four years to help Delaware high school students prepare for college and consider majoring in education. At a workshop for the teachers, Brown urged them to help promote the idea of careers in education among their students. 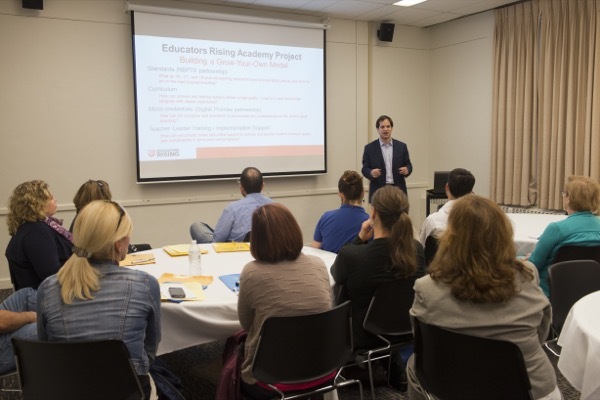 Educators Rising (formerly known at Future Educators of America and, before that, Future Teachers of America) has been expanding and updating the services and resources it can provide to schools, he said. In some high schools, chapters of the organization are a student club, while in some they are an elective class. The goal, Brown said, is to help schools without a chapter start one and to help those with existing chapters re-energize them. He noted that most U.S. teachers work within 20 miles of where they went to high school themselves  a statistic that was reflected in the group at UD, most of whom raised their hands when asked if they were teaching within that distance of their old high schools. These “home-grown teachers” who know their students and their communities are an important asset to the profession, Brown said. That’s a large part of the reason that UD started Success Through Education, said Barry Joyce, associate professor of history, who led the program with Hannah Kim, assistant professor of history, both in the College of Arts and Sciences’ secondary teacher education program, and Carol Wong, associate professor in the School of Education. 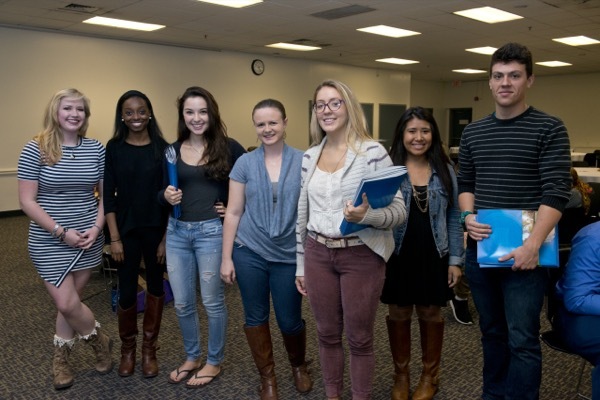 Each fall, Delaware high school students and their teachers participating in Success Through Education come to campus for a day, learning about UD’s admission requirements, financial aid, academic services and possible majors, including elementary, secondary and early-childhood education. The same students return in the spring for additional workshops, classroom visits and campus tours. The group this semester came from five schools districts: Indian River, Milford, Brandywine, Red Clay Consolidated and Christina. Students met in small informal groups with UD education students to chat about such subjects as academic requirements and life on campus. While their teachers attended Brown’s workshop to learn about participating in Educators Rising, the students filled out sample freshman schedules showing classes, study time and extracurricular activities. Many of the UD students who participated had attended the same high school as the visiting students. That kind of match helps show the younger students a clear path to college and an eventual career in education, Joyce said. “We want to make sure these high school students realize that teaching is still a really good profession,” he said.